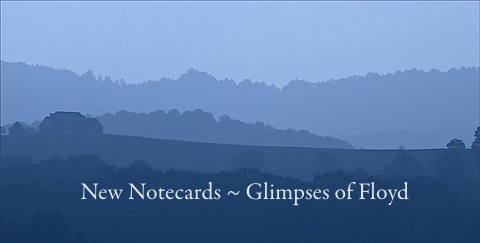 Enjoy The View: More Notecards Coming! I’m pleased to tell you that I will soon have renewed stock of the first three sets of photographic notecards. And, although I am still waiting for proofs for the final go-ahead, the FOURTH set of cards, Glimpses of Floyd, will soon be available. You can preview the new set on Sliderocket. [ Click here to start. ] Then click on a view to advance or hit the -> key on your keyboard. The order form is the last view of the series. I’ll eventually have a Paypal button on the order form. Not there yet. Anybody have good experience owning an “online storefront” site or package? Please let me know if you have problems viewing this slide presentation as it is a new means of accessing the cards. I may go back and tweak it–like adding a voice narrative welcome on the first slide–and if this seems workable (Sliderocket is in beta yet) I’ll go back and do something similar for the first three sets of cards. Enjoy! Oh–and since I’m only printing 50 sets of each series you can email or leave a comment to this or any other post to have sets reserved (as Christmas gifts, stocking stuffers and for thank-you notes!) Just be sure and mention which sets you will want and I’ll set some aside with your name on them. If there is interest, I’ll order more before the first of November. Played perfectly and I love the music too. Fred, is there a place in Floyd we can buy your notecards? The Floyd Country Store carries them, and so does Bells Gallery. Thanks for asking!